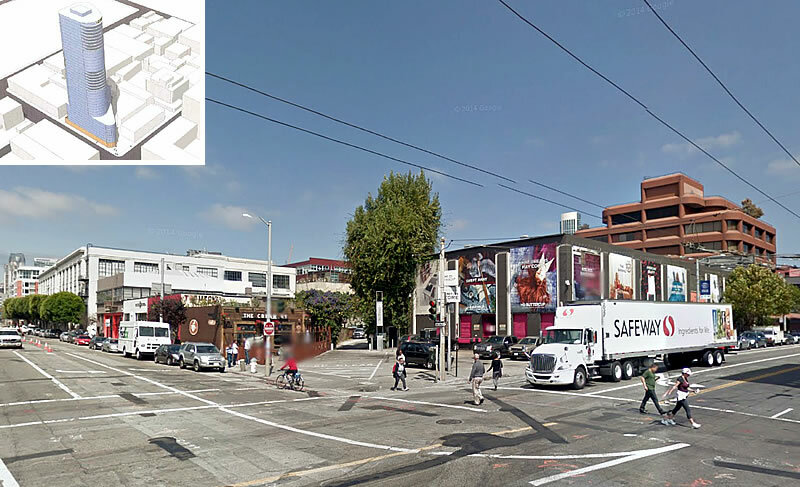 While Tishman Speyer has so far only filed their preliminary plans to construct a 400-foot tower with 450 condos over 10,000 square feet of retail along 4th Street, between Townsend and Bluxome and across the Central SoMa parcels upon which The Creamery and a few other little buildings currently stand, an earlier filing outlined the developer’s intentions of building a 350-foot sister tower on the adjacent HD Buttercup parcel as well. For scale, The Beacon across Townsend rises to a height of 160 feet in the middle of the block. And as plugged-in people know, there are plans for a modern 300-foot tower to rise at 330 Townsend and the potential for a few more big developments to rise within a block or two. 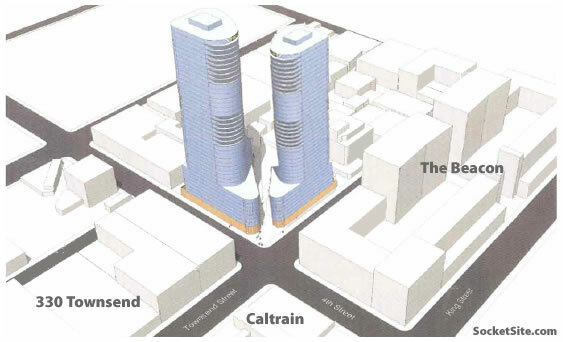 Do these towers (and others being built) have to take into account the future Caltrans-to-Transbay tunnel? i.e., when laying out their foundation and tiebacks? Or are we screwing that tunnel by building deep foundations and piers first? 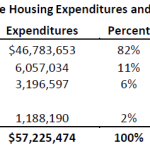 Not an anti-development comment; just curious. Yes they do, I remember reading (possibly in an EIR) that the Infinity tower foundation was design in such a way to avoid interfering with the tunnel. I think the tunnel itself only required some small changes to one existing old building, although I can’t remember which one. Also the tunnel is to run under Townsend, so only buildings around where the large radius turn is supposed to be are really affected. Do we know which architect is working on it? The original business times article quotes Steve Wertheim as saying that the towers would need 115 ft spacing or 85 feet for a slimmer tower. IIRC podium height is 85 feet from the draft plan. That would seem to indicate that the second tower would have to be rotated further away from the main tower and possibly slightly skinnier to fit, unless they are planning on trying to get an exception. I like how there are more and more high rises being planned in this part of the city. I really hope new Mission Bay developments have higher heights and I hope the Giants stay with their original Mission Rock design. One has to wonder how they get by with demolishing the old LIM furniture building. 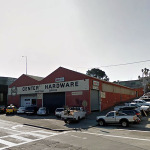 I believe it’s a historic resource and might just be in the historic warehouse distinct. The southern border of the south end historic district is on Lusk St.
Building could still be considered historic which will require full review by HC and then be subject to appeals. And if I remember right there are 3 privately owned condos at the rear portion of the property. I guess the owners could be enticed to sell at the right price if the developer is successful with entitlements. This would be awesome addition to the neighborhood. The sidewalks along 4th and along Townsend (some of townsend has no sidewalks at all!) are already too narrow for current foot traffic. This proposed development, including the podium, needs to be set back further. Views are not protected, as I’m sure you know. But that never seems to stop people from trying. I am amused, and sometimes appalled, at the ridiculous reasons people come up with to oppose projects when it’s obvious they are really just fighting for what they think are “their” views.